Game Day Queso: Football & Cheese: Sign Me Up! OK, guys, for years my family has enjoyed great football games and fun. We’ve seen great teams and great players come and go. My job during every game was to keep the food and beverage going strong and I loved it. I think that some of my earliest Pro football memories are of all of us watching the Oilers, wearing our Oiler blue, watching greats like Earl Campbell, Ken Stabler and others lead by Bum Philips. I think I may even have an autographed Earl Campbell cap and I have a friend who owns an original can of cola branded as Ken “The Snake” Stabler’s “Snake Venom”. 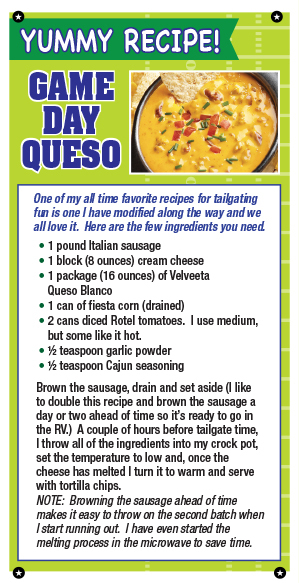 Now, next time you and your family get together, take a walk down football memory lane and throw in a little Game Day Queso for good measure!! !